The Very Hungry Caterpillar is a fabulous book for retelling. It has progression of numbers, the days of the week, it's all about food, and it has a miraculous ending. Every syllable of every word is right where it belongs. It just invites retelling. 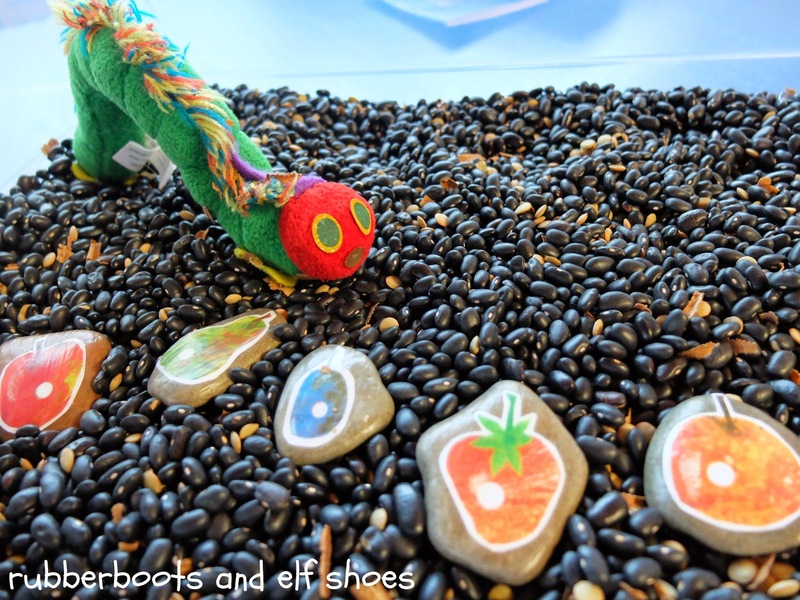 How about we retell the story with a sensory bin. The protagonist of our story is a caterpillar. I have one that came with a huge board book that I bought a few years ago. Moving on with the story: the caterpillar eats food. So, our caterpillar needs food. I did a couple of different things. First, I raided our play kitchen and borrowed toy food from friendly teachers. That worked absolutely fine - but the food did not look like Eric Carle's food. And the kids said that it did not have holes in it. Rocks and mode podge to the rescue. My hungry caterpillar has the "right" food to eat. No holes in the rocks - but we do have holes in the pictures. Now the caterpillar can grow and grow until he becomes a great big caterpillar. Jump to the end of the story: we need a butterfly. 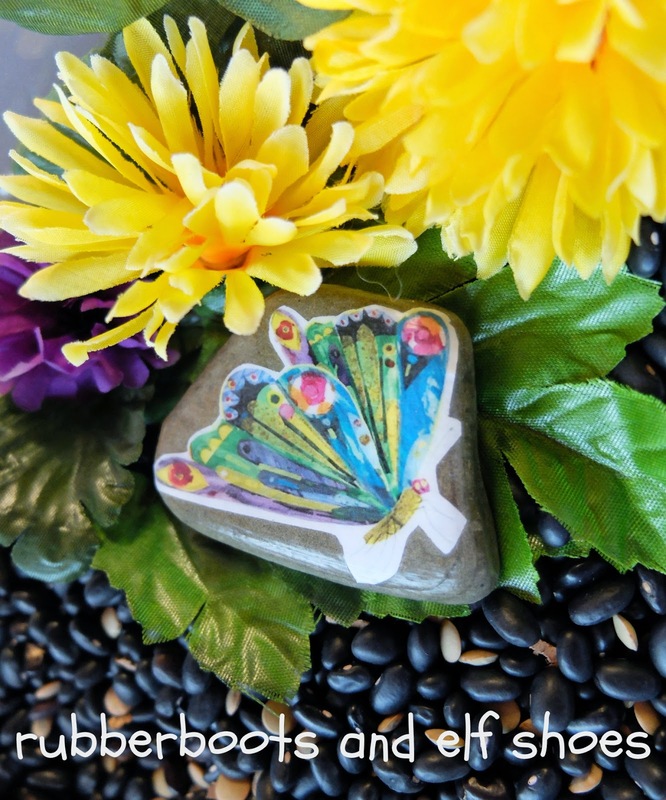 Before next butterfly season in kindergarten, I need to make a tiny caterpillar and a cocoon. Check out Anna's Resources for Young Learners and Make it Cozee for printables. As well as lots of retelling (even without different size caterpillars and a cocoon), the kids were busy with the usual sensory bin scooping and pouring and burying. This time, I didn't include any scoops or spoons. I wanted the kids to be totally hands on with the bin. 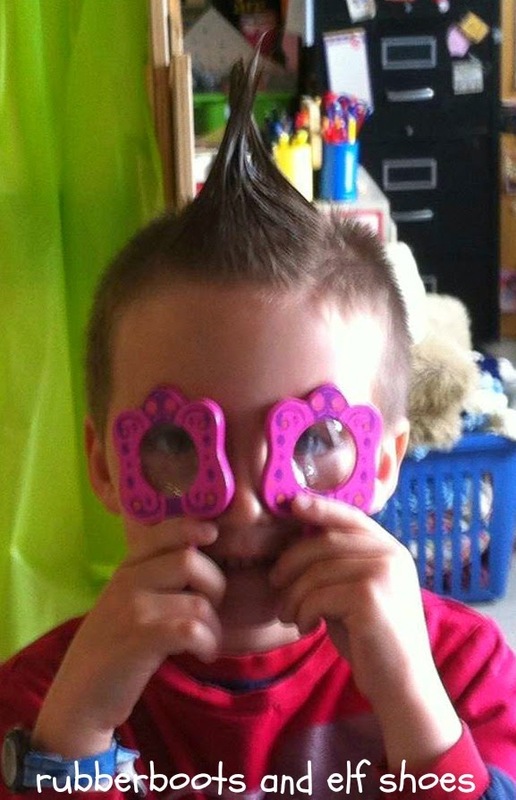 I added the butterfly magnifying glasses because I had them in my stash of things that kindergarten teachers tend to buy. I had no clue what the kids would choose to do with them. That works, the beautiful butterfly will need to go to the flower pot for a nectar feast. Thanks. 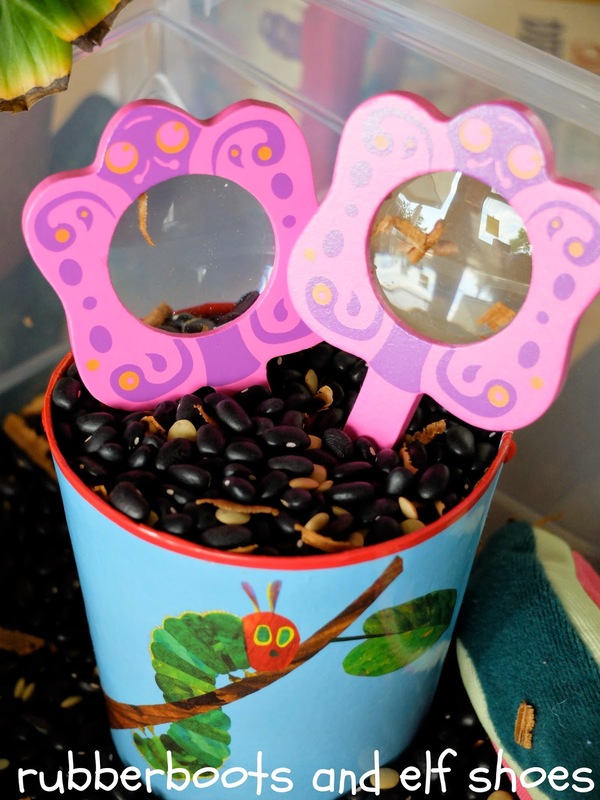 I have been wanting to try a book based sensory bin for a while. Now to decide on what to try next. Ideas? Thanks. It was fun to make. 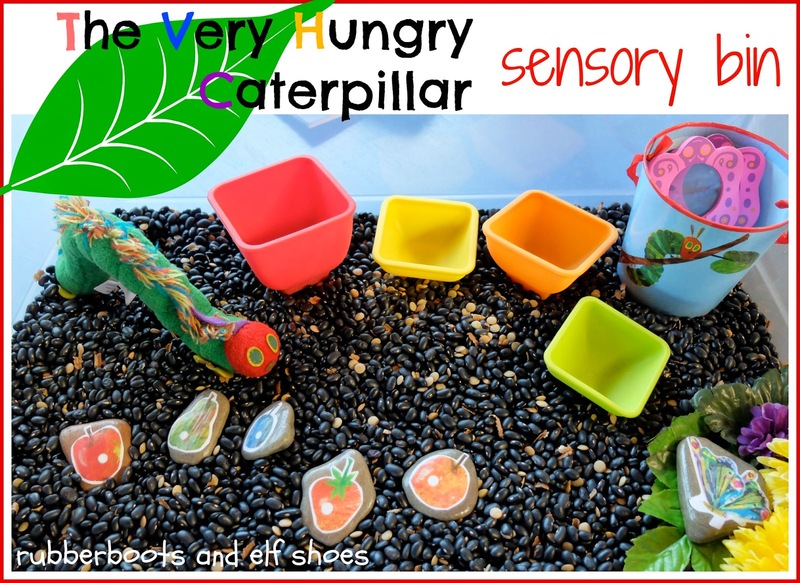 I love this Very Hungry Caterpillar Sensory Bin. I pinned it to my Very Hungry Caterpillar board! Thanks for sharing on Artsy Play Wednesday. We always enjoy your fun ideas. Thanks for dropping by, and for pinning. Love this, Sandi! I'm pinning, too. What a cute outfit for back to school. I would love to see a picture of her in her new outfit. Really cute idea! Love it. Thanks Leandra. Thanks for stopping by. The Very Hungry Caterpillar is such an amazing story. And there are so many wonderful activities that it has inspired. Much gratitude to Eric Carle. 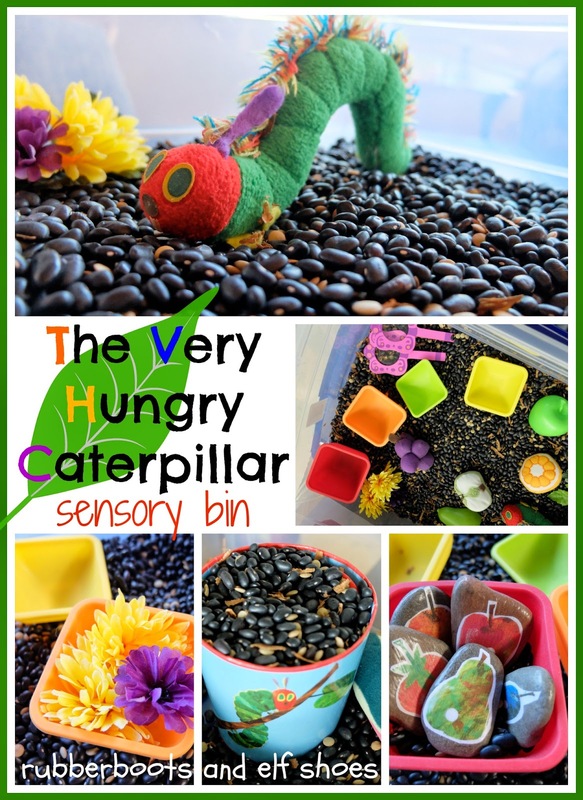 What a great sensory bin!! Thanks for sharing at Sharing Saturday! Thank Carrie. I really like it to. And more importantly, the kids did. 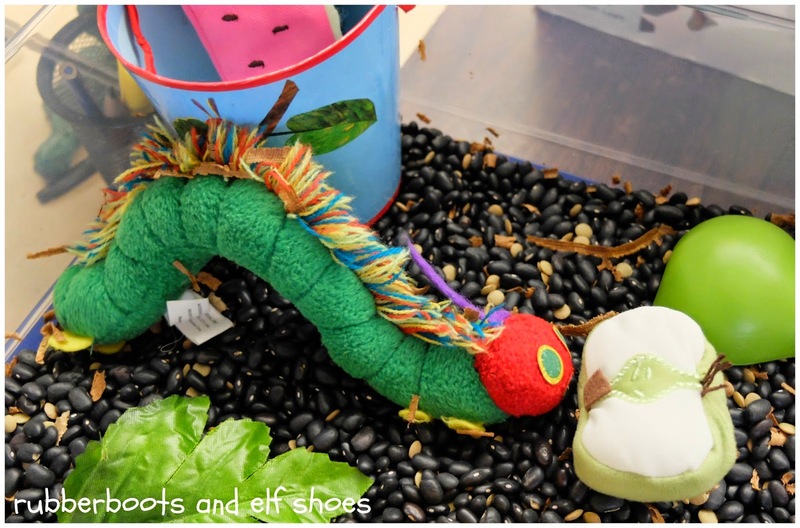 I love your sensory bin! What kid would be able to resist playing with this?! Thanks Jill. I even caught my husband letting the beans run through his fingers! Barnes and Noble sells the big fat caterpillar if you want to add that to your collection. I bought it for my son last Christmas and he loves it. Oh, and inside the the caterpillar is a blanket that when unfolded show the beautiful butterfly. I love this! Thanks so much for sharing such awesome ideas!